Padrinos play an important role in Hispanic culture and family history. Identifying and tracking the names of padrinos found in the records of your ancestors can provide clues to help further trace your ancestral lines, and can help you develop a better understanding of the kinship ties between various families in your ancestral hometown. Documenting padrinos in your family tree is important. Traditionally padrinos have been a male (padrino) and female (madrina) who are expected to provide a guiding influence in the life of the person for whom they are standing up. Sometimes, only a single padrino or madrina might be selected. Parents choose padrinos for different stages of their child’s life, and the responsibility of padrinos can range from spiritual, to financial, to social, to legal. Perhaps the role most familiar to non-Hispanics is the role of padrinos in a baptism; these are the godparents. However, the term “sponsors” is the more general translation for padrinos. Parents (and sometimes the child, depending on age of that child) also choose padrinos for life events such as confirmations, quinceañeras (celebration at 15 years old of a girl transitioning to womanhood), and weddings. For those events that are Catholic sacraments, Canon Law has specific requirements about who can serve as the padrinos. Asking someone to serve as a padrino or madrina is a sign of great honor, and accepting this request traditionally was not done casually. Padrinos were close family or friends, part of your ancestor’s FAN Club. We genealogists need to pay attention to the names of padrinos referenced in historical records, and document those individuals in our research notes and family trees. Pablo Sanchez and Juana Compean are a couple that I definitely want to pay attention to when researching my Nieto Mesa family line further. This couple was important enough to my 3rd great-grandparents that those 3rd great-grandparents selected Pablo Sanchez and Juana Compean to be the godparents to one son, and selected Pablo and Juana’s daughter to later marry their oldest son. There are a few ways that I document padrino connections in my Ancestry Tree. 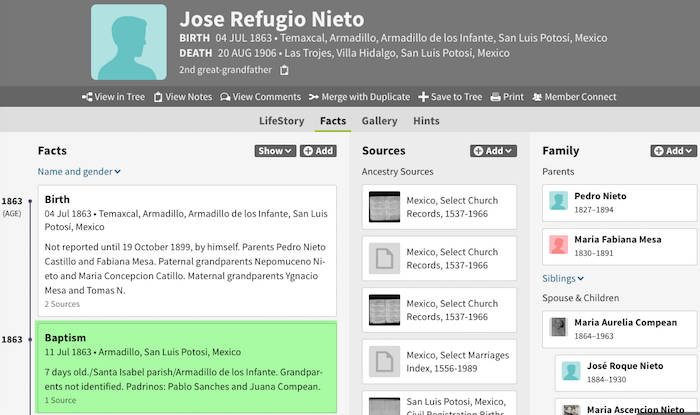 When I add a new Fact for an ancestor or relative, I include the padrino names in the Description field for that Fact. I want to be able to easily read those padrino names any time I glance at the Fact (in my case, usually a baptism or marriage). Figure 1: Include the names of padrinos in the Description field for the relevant Fact. The area highlighted in green illustrates how I do this. I also want to create a relationship link from my ancestor’s profile to the Tree profile page for each padrino, and I cannot do that from the Fact entry. Ideally, I want to be able to do this in a manner similar to how we link an ancestor’s profile to their parents, siblings, and children. This would allow us to use the Edit Relationships feature, then search for an existing individual in our Tree (or create a new one on the fly), link to that other person, and automatically have them displayed in the right sidebar of the ancestor profile. But Ancestry only supports that feature for use with individuals in a parent, child, or spouse role. Figure 2: The Edit Relationships feature allows us to automatically add and link individuals in our Ancestry Tree to an ancestor profile. Figure 3: However, that Edit Relationships feature only supports parent, child, and spouse roles. I would really like to see Ancestry add a Padrino role to the Edit Relationships feature (probably called something more generic like godparent or sponsor), because of how important those relationships are to Hispanic families. Godparents for baptism are an important role for other Catholics and some Christian denominations, from non-Hispanic cultures; so it’s not just Hispanics that would benefit from a “godparent” role in the Edit Relationships feature. So how do I link padrinos to my ancestor in the meantime? I use the Web Links feature that is available in the center column on your ancestor profile. 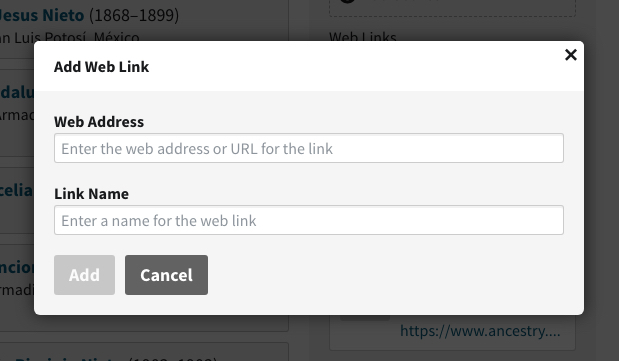 You can use Web Links to save any type of web content that has a hyperlink, such as links to a Facebook profile, a record on FamilySearch, a YouTube video, etc. I use this feature to save web content that is relevant to that particular ancestor. Since Ancestry Trees are web pages, the profile page for every person in your Tree has its own unique URL. 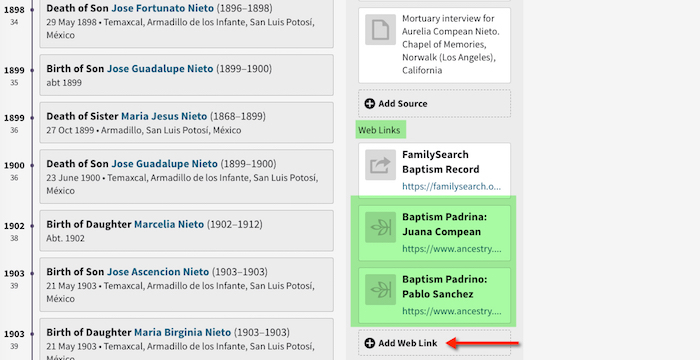 Figure 4: The Web Links feature can be used to save the URL to each padrino’s profile in your Tree. I copy and paste the URL for the padrino’s profile page into the Web Address field of the Add Web Link dialog box. 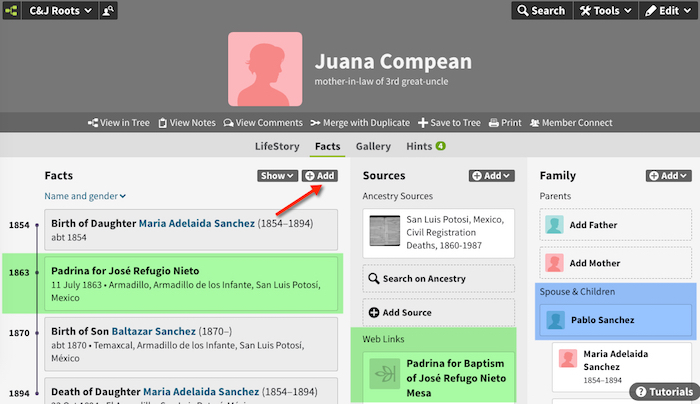 I then create a distinct meaningful name in the Link Name field, such as “Baptism Padrina: Juana Compean.” This allows me to quickly and easily view and access those links whenever I am on my ancestor’s Tree profile page. Relationships are not just one-sided. Documenting and linking padrino information on the relevant child/teen/young adult’s Tree profile page is just half the story. You want to do the same thing on the padrino’s profile page so that when you are viewing that person’s profile page, you can see and quickly access anyone for whom they served as a padrino. That same individual might be the baptism padrino for one person, and the marriage padrino for another. Figure 6: From each padrino’s profile in my Tree, I do the same process, but with the opposite emphasis. 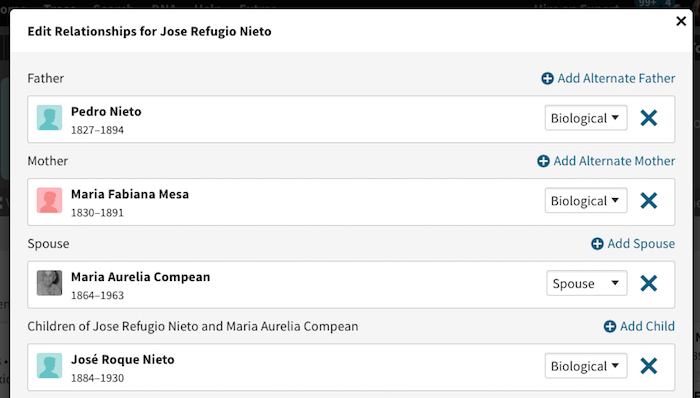 Add a Fact for their padrino role, and add a Web Link to the relevant profile page. 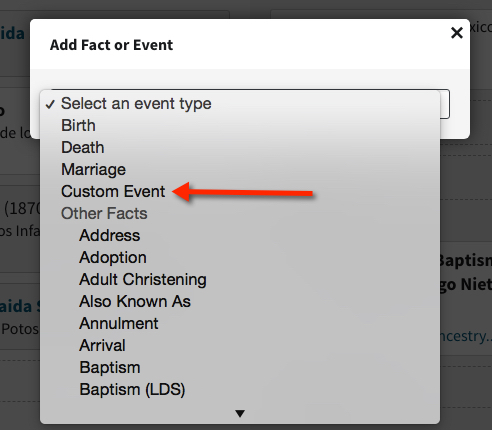 Figure 7: To add a “Padrino Fact” to the profile, I create a Custom Event. Have you found others ways to document and link padrino relationships in your online tree and/or genealogy database? If so, please feel free to share your process by adding a Comment below. SIGN UP NOW with your email address to get my FREE email newsletter, HISPANIC RESEARCH & HERITAGE, delivered to your inbox the last week of every month! Packed with bonus tips, collections, events, and news recommended by me. Your email address will never be sold or shared with others. Just a hint ,,,,,padrino is the male figure while madrina is the female counterpart ….. Correct. That’s exactly why I use both terms, and explain that padrino is the male and madrina is the female. But the plural when referring to both uses the male plural, padrinos. My maternal grt grandfather and his lineage was from Armadillo de los Infantes, S.L.P. Thanks for stopping by. Small world! You’ll have to share your surnames with me. Most of my family is from nearby Rancho Temaxcal in that municipio. Their records were usually registered in Armadillo or Villa Hidalgo. I visited the region for the first time this past November, and I fell in love with Armadillo. It’s so beautiful, with gorgeous historic buildings. And the gorditas from the place right across from the church are spectacular.